Competitive demands require quicker, more effective and innovative problem solving. Problem solvers are required to quickly provide solutions to increasingly complex problems, develop and design new and innovative products and processes – all while reducing research and development time and costs. I’ve Been working on a series of workshops and consulting on innovation and developing a culture of innovation. 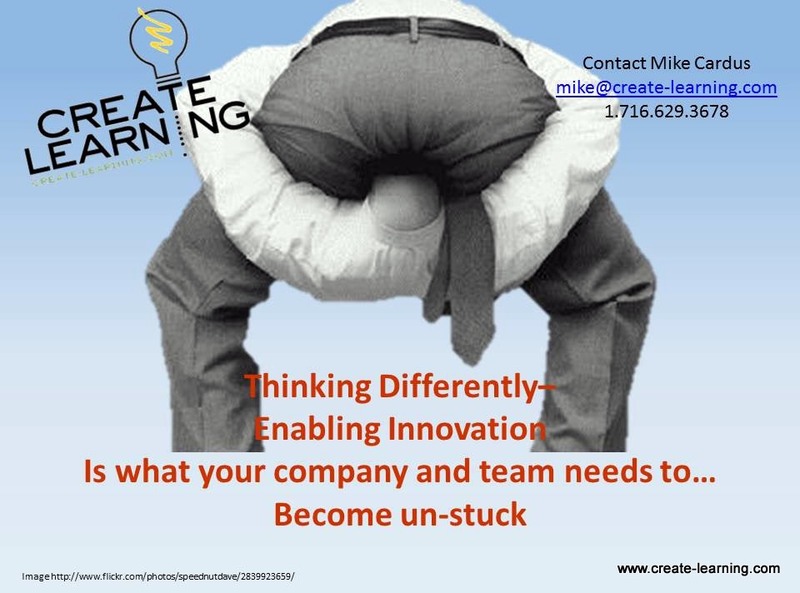 The slideshare above is from an interactive workshop about thinking differently and some tools that work to allow different thinking to happen. You can read more about the workshop in the description below. Here are some links to the innovation activities that were part of a recent Thinking-Differently Enabling Innovation Workshop. What’s the Companies goal & how do you fit in? we ended with personal 2 week achievement plans based upon the Nine Windows coaching…Creating over 30 ideas in this companies Solutions Bank. Creative thinking is a critical skill required by all people within their roles at work, yet it is generally done by trial and error – the thinker creates an idea and determines if it will work – which is basically guessing. Not only is trial and error limited by personal knowledge, it can take many ideas and a long time, sometimes years to identify a good idea and thinking is constrained by a “stuckness” in how things are and how things should be. Learn ways to overcome “stuckness” in your thinking and quickly solve problems. What did you find useful in the slides above? How can you apply the ideas?